Convert any files format such as Word, Excel, PPT to PDF format is easy. You can easily choose from opt in list to convert file format to PDF format. But when come to PDF convert to Word, Excel, Html file format, user could chaos and spend too much time in convert file to PDF. Now you can convert file to PDF format in batches (book, contract) with All PDF Converter. All PDF Converter features one click button that allows users convert PDF files to 7 types format such as Word, Excel, EPUB, HTML, Image, Txt, XML in short time while retaining the original layouts and format to ensure keep file quality as original format. To get started, user just need add a PDF document that willing to convert by either dragging or dropping it or by clicking the “Add files” button to convert. User able to choose the convert format and set specified page range convert. 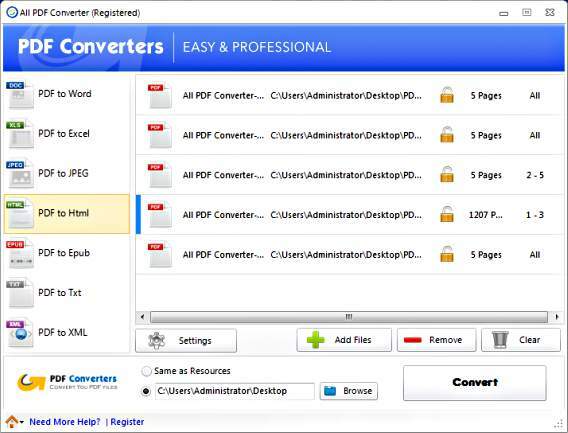 Install and launch All PDF Converter. Next, fill in the genuine license key below to activate the full version. All PDF Converter compatible with Windows XP, Vista, Windows 7, 8, and Windows 10.